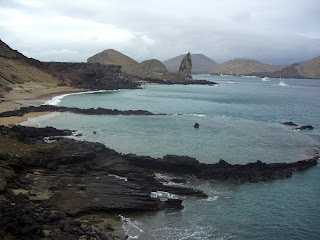 OK - there I stood on the shore of Bartolome island having squeaked into my wetsuit, placed the goggles and breathing sprout (clear plastic, who knows who used it before me) on my head happy to be one of the handful of brave folks wanting to snorkel in a rather rough bay. As I tried to put on the flippers, there lay the challenge: how the heck to get in the water without tripping on those clumsy plastic flippers? When I figured out it was to back in heel first, I was on my way , loving to swim, and looking below at a murky sea wondering what I’d find. I went a fairly long ways out, swimming smoothly, propelling myself with blue flippers in the cold water. On tilting my head up above the water line to see how far I had gotten, in front of me I saw this ugly prehistoric face swimming my direction at a pace - it was a marine iguana. I pulled off the head gear, laid on my back (I'm better at back stroke), paddled like mad anxious to get out of his way - i.e. terminate this project. No one tells you who is dangerous, who is not, nor what to do. Lack of information from the staff worries me. Refreshed by the deep swim, (and thankful I hadn’t run into one of the many "friendly" white-tipped reef sharks) I left the sea. puffing, removed flippers and head gear and walked to the corner of the playa where there was a colony of sunning sea lions, among them a mother nursing her fairly new baby. Cameras clicked as we stood within four or five feet of the lounging beach creatures. It was our first close encounter with them. Soon they’d become like traffic at rush hour. They honk. After sliding onto the Zodiac to return to the ship, there was a great fuss (as animal watchers are wont to do) because on the black lava shore was a Galapagos penguin, the only species which has adapted to the warmer winds, water and climates as far north as the Galapagos area. They are smaller and easily camouflaged against the shore line. I couldn’t even see the penguin everyone was pointing out, because when a boat gets near, he turns his back to blend in with the lava rock. But a flash of white and I was able to pick out his form. He does the same things other species of penguins do, same breeding habits, but no krill, rather another kind of school fish called ohone that is easy come, easy go. What damages these penguins most is the periodic arrival of El Nino. The warm torrents of rain can wipe out a penguin colony. They were reduced to approximately a thousand by the effects of El Nino in ‘82 and ‘83, then the fast return in ‘98. Now they may have reproduced so they number 2000. One penguin is all we saw. One, the loneliest number, as the song goes. Can you find the penguin in the photo to the left? We endured a two hour outing to an island that looks like Neil Armstrong’s moon. Odd looking rock is what remains from volcanos a million years ago, and there were many "ovens" where lava once bubbled. Pinnacle Rock, an eroded tuff cone, is a familiar symbol of Galapagos. The landscape was mesmerizing as I climbed uphill, but I asked the guide, Miguel, where are the animals? Are these outings only to look at rocks? He gingerly promised they were coming up. I guess there was an order of revelation in tour plans so you leave remembering the best, sort of like Disneyland rides. Whatever, I was photographing rock as if it were a tiger. The coloring, rose, peach, yellow, gray of much of the rock was due to the rich minerals within its makeup. Don’t pick up a sample, we were warned, as they have special X-ray machines at the airport that pick up snitched rocks. 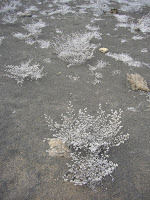 Mingling among these rocks were survival plants - a delicate almost lacy one nicknamed tequila ( grey mat plants -see photo), and the endless lava cactus, clusters of hairy cylinder stalks that find life in the rock it grows on. Careless women were losing their hats in the strong wind (which guides had to delicately retrieve without damaging the lava dust landscape) as we hiked up a 400 foot hill on a wooden platform of steps (the national park built that so people wouldn’t destroy the soil beneath it.) I picked up speed to get exercise up the incline and a challenge to get to the top (mine) in record time to touch the signal light. There, in every direction, you could see the effect of a volcanic past, where crater rims were distinct and had formed a large pool in the sea below. The afternoon offered another adventure to remember. Because of the huge currents bashing against the shore line at Point Egas on Santiago Island, landing was not only wet but dangerous. When the helpers yelled, get out of the Zodiac fast, everyone sat like a bump on the log, except me, well-trained in Zodiac maneuvering by the crew of the Endeavor (Alaska), and I threw my legs over the fat edge and jumped quickly into the waves, getting soaking wet in the act. But you dry in no time. The theater before us was a mile of marine iguanas, playful Galapagos fur seals and their newborn pups, rare birds, lava herons, grey lava gulls, American oystercatchers with long red beaks, red footed swallow tail gulls, hundreds of Sally lightfoot crabs unique to this island (they are orange and red), a Galapagos eagle feasting on an iguana, and a tiny lemon yellow warbler curious about my sandals. 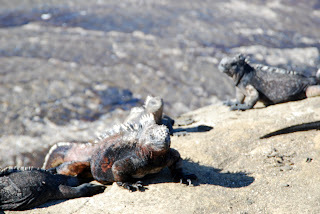 Trying to wind a route through the hundreds of marine iguana, gray and black, mostly, the same color of the layers of lava rock was like trying to crawl over a row of legs packed into the FedEx Forum. I feared stepping on a tail of one of those creatures because they were piled one on top of the other with faces only a mother could love. It was cluster love as these reptiles sat on each other for warmth, and moved just far enough away from the incoming tide, hating being disturbed as they dried out. Baby Seals at Play. Would Mama Return? 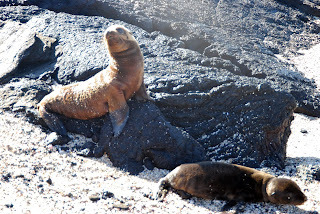 Not only that, each lump of rock was another Galapagos fur seal. One enamored of a fellow tourist and chasing him up the rocks as he fled her sniff. It was funny. We got up close and personal with newborn seals, careful not to put our hand print on them or our smell which might cause a mom to abandon them. And suddenly I realized I’m in Galapagos. This is unique. The animals were as curious about us as we them. I even got drawn in by the rare birds and the ever present orange and red crabs, unique to these islands. The red footed American Oystercatcher didn’t flinch as we passed by, and there was a bird just the right gray black to look like another lava rock, who didn’t move a feather as I stepped near him, my only way out. All around us a very turbulent line of waves smashed against the rock and limited the access we had to some areas, and to a phenomenon called Darwin’s toilet. The water flushes out through a tunnel of rock, into the sea, then fills back up with a force of a fat geyser, foaming over the rim of the hole which is about ten feet in diameter. It was fascinating, just as everything else on these islands on which evolutionist Darwin found answers to his questions. I’m still looking for the boobies. Darwin's Toilet.